We are looking for innovative, unique, and cool audio content for our Dance sound-package. Our product is a mobile song-mixing application for creating unique audio tunes that you can save on your mobile device and share with your friends. The tunes are created by selecting from existing in-app clips combined with user's own recordings. You can combine up to three clips from different categories and make a voice recording on top. All the tracks are then combined to an audio file in the mobile application. We are looking for innovative, unique, and cool audio content for our Dance sound-package. We are looking for a package of five different themes of modern, mainstream dance music. It's important that the themes are diverse in terms of style (eg. House, Trance, Electro, Techno, Dance-pop) and sound. Pay special attention to the creativity, quality of your sounds, production and mixing. Basically, you need to make 5 different short songs (themes). The length of each is 8 bars, tempo 125bpm, ~15 seconds, and key C/Am. 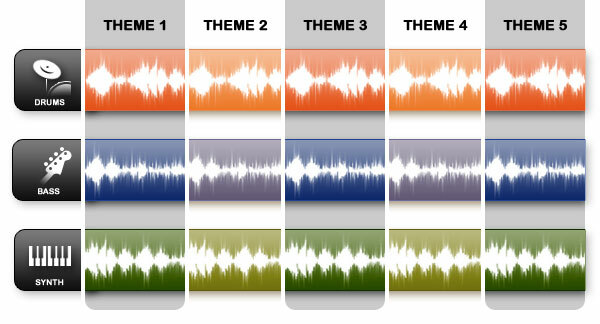 When you submit your entry, just paste the five themes one after another (in total of around 1:30 in length). You can have any number of tracks (instruments) in your songs, but in the final delivery (contest winner) the arrangement needs to be split into 3 files/sections ("Drums", "Bass" and "Synth"). In the mobile application, user can select any of the five Drum-loops, combine it with any of the five Bass-loops, and any of the five Synth-loops. Therefore, all of the clips in each section have to fit together with any clip in other sections. In this way, the user can create unique combinations by picking a clip from each section and playing them together. IMPORTANT: Make sure that all of the loops are interchangeable. Please take a listen to the entries in our previous contest "Create a Happy Birthday sound package" for reference. Unfortunately, due to overwhelming amount of messages, we can't give personal feedback. If you have general questions concerning the contest, please use contest discussion board.